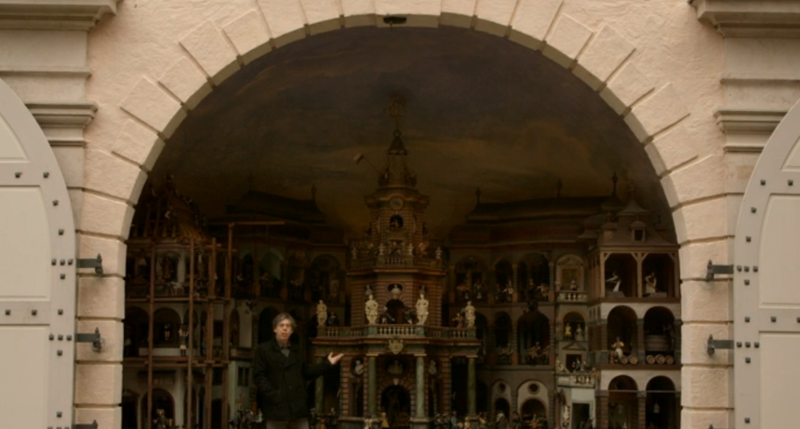 The Hellbrun Mechanical Theatre is a huge automaton. It was built between 1748 and 1752 and is housed in the Hellbrun palace in Salzburg. The machine was built by a salt miner called Lorenz Rosenegger and was commissioned by Archbishop Andreas Jakob Graf Dietrichstein. 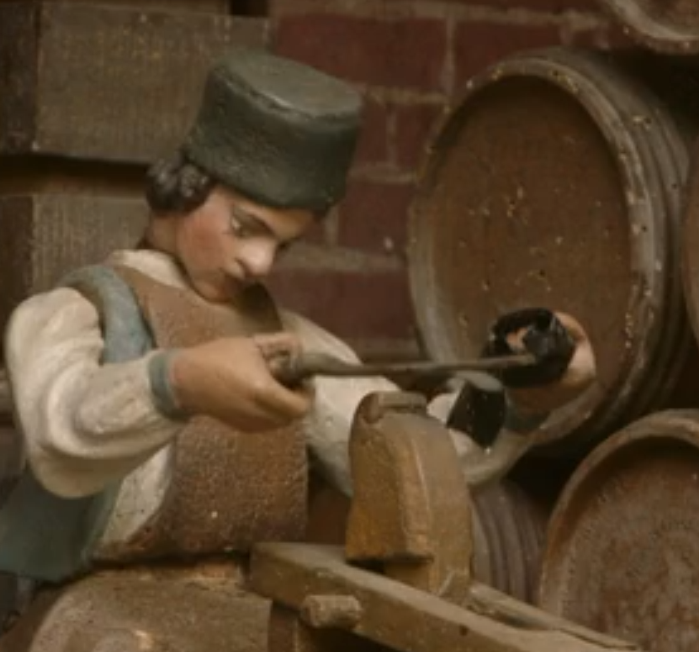 I came across this animated sculpture while watching a fascinating BBC programme called 'Mechanical Marvels: Clockwork Dreams' which was written and presented by Professor Simon Schaffer. That's him standing in front of the mechanical theatre in the image above. All of the images of the Mechanical Theatre used in this post are screen shots saved from this documentary. The theatre shows a scene of different trades and professions busily working, watched by the governing elite whose figures move relatively little. Apart from the incredible skill of Rosenegger in carving the 200-odd figures used in the machine and animating most of them with a water-powered system of mechanisms (together with a water-powered musical organ to cover the sound of the workings in action), I was also struck by the glimpse that the theatre gives into the clothing and tools used by the woodworking trades of the time. The woodcarver has his workpiece held on a kind of rotating spit-like frame. Chris Pye notes that this type of device is still in common use in some places, such as Southern Germany. 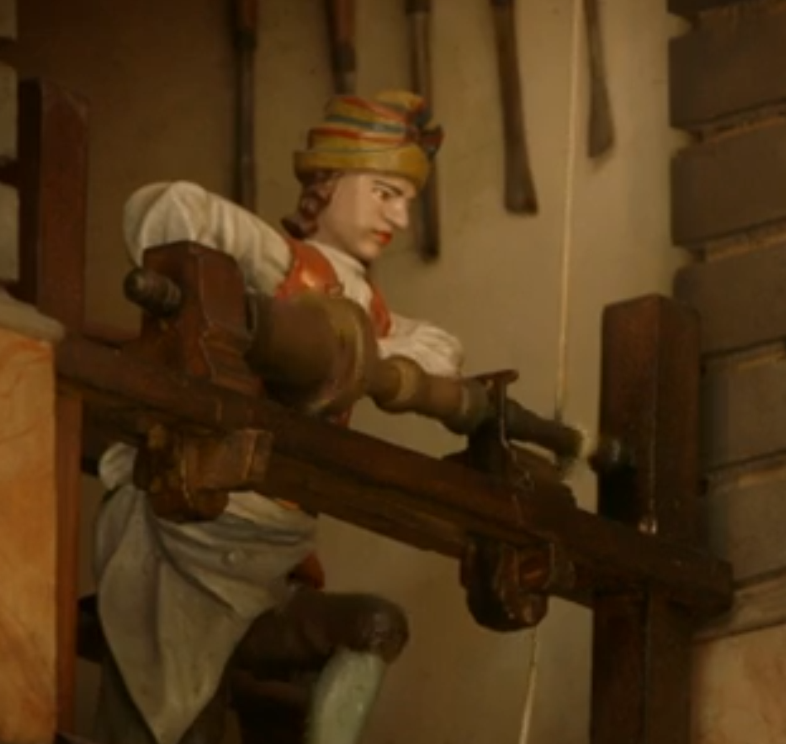 I've seen it on illustrations of medieval woodcarvers at work centuries before the Hellbrun machine was constructed. Many contemporary carvers prefer to work on larger pieces with the carving held vertically instead of horizontally, so that it is orientated the same way that it will eventually be displayed. This frame is in Joachim Seitfudem's studio. Jo is based in Bristol but trained in Bavaria. The sawyers at work. All of the tradesmen are shown wearing aprons and many have coloured lederhosen-style braces across their chests. I wonder if the colours of their hats or braces mark them as members of different craft guilds, or if they are just random? The turner is at work on a pole lathe (which I imagine would be powered by a springy frame rather than a pole, as it is indoors). His tools are hung on the wall behind him. 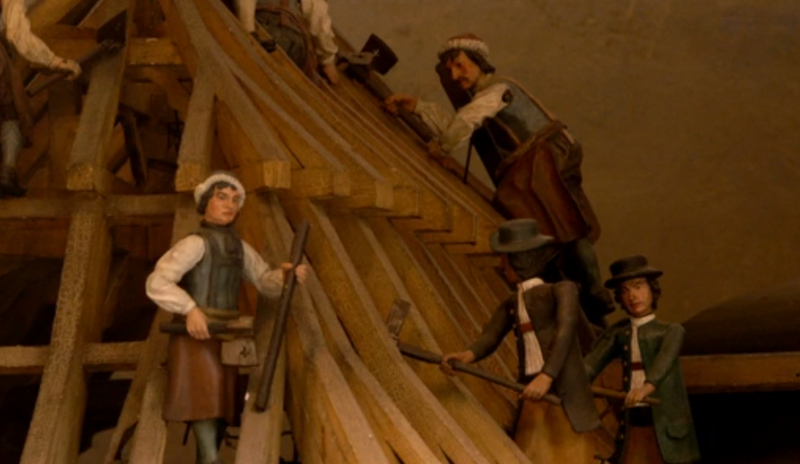 The timber framers build a roof. Two workers wear caps, the others are dressed very similarly to each other with black hats. Journeyman carpenters from this region wear their brimmed black hats as one of the signs of their status even today. 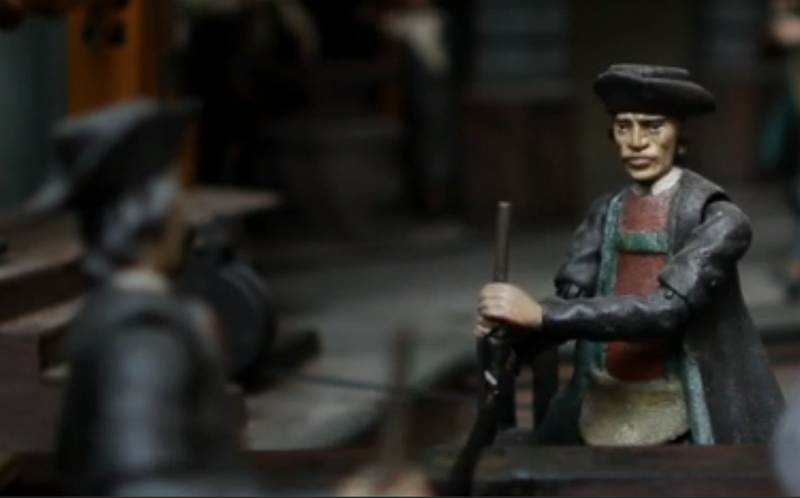 Are the two workers lower down the roof journeymen, or do these figures represent different trades altogether? 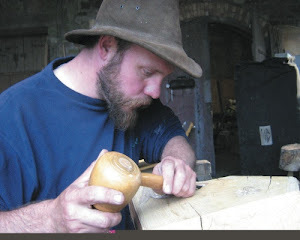 The cooper works with drawknife and shavehorse to make barrels and buckets. As with the pole lathe shown above, modern green woodworkers use equipment that has basically changed very little from that shown by Rosenegger. This pole lathe and shave horse (made by Tom Redfern) were in use when teaching these skills at the Green Gathering a few years ago. Schaffer also notes that there is another, darker side to the Hellbrun mechanical theatre. The salt miners were 'radicals and insurrectionists' and Rosenegger had an armed guard to keep him at his work. The machine was not just an entertaining snapshot of life at the time. To its intended audience of wealthy aristocrats, it gave a view of workers behaving themselves in an 'ideal society'. One of the first things that I saw in Bristol, on walking out of the coach station, was this series of large sculptures carved into brick. They are on the wall of the Bristol Eye Hospital and were produced during the mid 1980s by Walter Ritchie, who was one of the last apprentices to work with the famous and controversial sculptor and designer Eric Gill. If you don't recognise Gill's name, you would have regularly seen the typeface that he designed called Gill Sans, which is pretty much a standard on any word processing computer programme. I think that you can see his influence in the style of the designs that Ritchie carved. Walter Ritchie died in 1997 and many of his other carvings in brick have sadly been lost, as the buildings that they featured on were demolished. He preferred to make public sculpture rather than private artworks. The brick panels were the largest non-reinforced brick sculptures at the time and were actually produced at Richie's home in Kenilworth, Warwickshire. Each panel was then transported in two pieces to be installed into their present homes. The quote on the final panel of the series comes from a lecture on the theme of 'Creative Man', given in Oxford in 1947 by Viscount Samuel. I still think that these relief carvings are beautiful and inspiring, despite having seen them many, many times when passing by. The use of carving techniques directly into house bricks is also unusual and interesting. Here are some details, so that you can see the textures and markings that he created. 'Wildfest' is a small festival organised by the community in Knowle West, together with Ben Carpenter of Youth Moves. It is held on the Northern Slopes, an area of public land with a fantastic view across Bristol. I've run the pendant carving workshops there before and it was great to be invited back again. People visiting the festival can carve their own designs into pendants made from locally-grown hardwoods, then take them home. A few of the visitors remembered doing the activity last time and some had even managed to keep their pendants until now, which was very nice to hear. It was also nice to catch up with a few fellow festival regulars, especially Keith and Linda Hall of Specialised Nestboxes. Even a heavy shower of rain in the middle of the afternoon didn't stop the fun and there was pretty much a continuous stream of keen young carvers. ...and in the rare brief gaps in between, the view was there to be enjoyed. After several unexpected delays, the locally-grown oak to be used in making a new bench for a public space in Bristol has finally been milled! This new bench will be situated next to the famous Clifton Suspension Bridge, at the end of the Downs. It will be the centrepiece of a newly-renovated children's playground and will feature carvings celebrating local history and wildlife. I was helped a lot in milling the timber, at a yard just outside Bristol, by local chainsaw carver Andy O'Neill. Andy brought along his Alaskan mill, which is basically a frame fixed to a powerful chainsaw. This allows boards to be cut fairly accurately, to a given dimension, from timber that may be in places inaccessible to larger mobile sawmills. The first board is now in my studio and I'm really looking forward to getting started. Hopefully, the bench should be finished by the end of November.